This is the second time in two months that a Navy destroyer based at the 7th Fleet's home port of Yokosuka, Japan, has been involved in a collision. Seven sailors were killed when the USS Fitzgerald collided with a tanker south of Japan in June. Ten U.S. Navy sailors are missing and five have been injured after the USS John S. McCain destroyer collided with an oil tanker near Singapore early Monday morning. 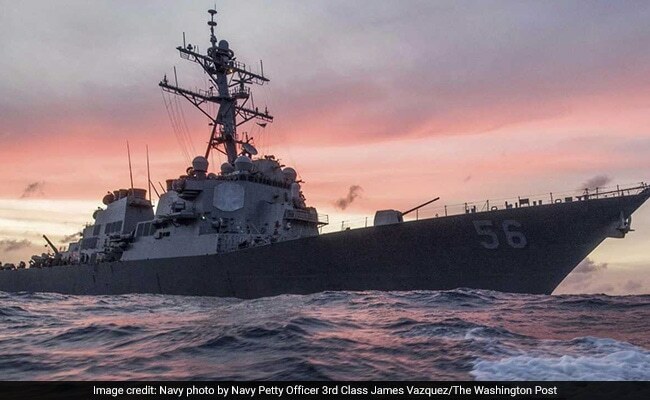 The guided missile destroyer and the Liberian-flagged merchant vessel Alnic MC collided near the Strait of Malacca at 5:24 a.m. local time, the Navy's 7th Fleet said in a statement. Initial reports indicated that the destroyer sustained damage to its port side at the rear, but is currently sailing under its own power and heading to port in Singapore. "The extent of damage and personnel injuries is being determined," the 7th Fleet said. Search and rescue efforts are underway. U.S. Navy Seahawk helicopters and Ospreys have been mobilized, joining tugboats from Singapore, a Singapore navy ship and helicopters, and a Singapore police coast guard vessel. "Our first priority is determining the safety of the ship and crew," Adm. John Richardson, chief of naval operations, wrote via Twitter. "As more information is learned, we will share it." President Donald Trump, returning to the White House on Sunday night, responded to reporters' questions about the collision by saying: "That's too bad." The McCain, a 505-foot-long Arleigh Burke-class destroyer based at the 7th Fleet's home port in Yokosuka, Japan, had been on its way to a routine port visit in Singapore. Shipping data showed that the Alnic, a 600-foot-long oil tanker with a dead weight of 50,760 tons, also was on its way to Singapore. This collision comes just days after the Navy issued a report listing errors that led to a collision between the USS Fitzgerald - also a Yokosuka-based Arleigh Burke-class destroyer - and a much larger container ship just south of Japan in June. The collision killed seven sailors, all of whom drowned in their berth compartments when the container ship struck the destroyer's side.